In between songs, Frank and his friends discuss gerrymandering, racism, the alt-right, voter suppression, and their own experiences going to the polls. In January, Ocean hinted that he’ll release new music in 2018 — is that part of what we’re getting today? Tune in to the show live via Apple Music from 9 a.m. to 10 a.m. ET. 6AM LA / 9AM NYC / 2PM LDN. 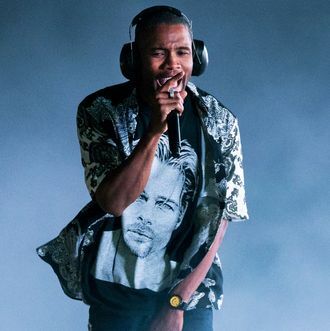 Update, 12:35 p.m.: Frank Ocean is Pokèmon-sending you to the polls today, whether you like it or not. The musician has set up pop-up shops in Houston, Miami, Dallas, and Atlanta (chosen to support Stacey Abrams in Georgia, Andrew Gillum in Florida, and Beto O’Rourke in Texas). Voters get free merch, according to a message posted to his Tumblr: “Bring proof (a photo of you at the ballot) that you voted to any of the locations below and get some free merch. Because God bless America.” Well, hello! Let’s celebrate that! Is Frank Ocean’s Smile the Best Smile?